In this day and age where some people do not have the time to even take a deep breath, you should feel lucky that you have some free time on your hands, so rather than just spending your time lying around and doing nothing you ought to make each and every moment count by doing something productive that interests you.So here is a list of some productive things to do in your free time, you are bound to have a lot of fun! One of the most noble as well as productive ways to spend your free time, would be to volunteer for a local non-governmental organization. If there is some cause which you feel strongly about then there would most certainly no better way for you to be spending your free time. There are innumerable social evils which are rampant in the society, if you do your bit to fight against them or even spread some awareness about it then you are bound to help many people, without even knowing it. The home is where the heart lies and in your spare time you should make it a point to settle your house and get various things in order. There is most certainly some truth in the common saying that ‘A clean home is a happy home’ so rather than just throwing caution to the wind or spending hundreds on a housekeeper you could always get down to doing things on your own. If your house is well kept you will surely feel a great deal of pride and joy. Irrespective of whether you have two left feet or you are a great dancer, you should most certainly consider signing up for a dance class alone or with some of your close friends. Often what people are unable to express through words they are able to express through the movements of their body. Even if you think that you are terrible at it, you should just remember that everyone is just there to have a fun time, no one is going to make fun or ridicule you. Rather than sitting at home doing nothing in your spare time, you could always consider going for a long walk or even a jog. Doing these two things will really help you gather your thoughts as well as keep healthy. So instead of postponing your appointment at the gym or saying you will go for a walk tomorrow you should just take the plunge and get to it. Over time you will notice that going for a walk or jog will make you feel so refreshed that it will become a part of your daily schedule. One of the most productive ways to spend your free time would be going to visit some famous tourist attraction in your city that you have never visited before yourself. In the process you will not only appreciate your city more but you will also learn a great deal about it. Exploring the place you live in will really help you fall in love with. You could choose to go on this little adventure alone or even with your friends. Don’t forget to buy some postcards for your scrapbook! In today’s technological age there are innumerous people across the globe that spends their free time blogging. Your blog could be on anything that interests you, whether it is cooking, sports, movies, societal problems or even books. No matter where your interests lie, or how unconventional your blog is, if you write well and make your blog interesting then you are bound to attract a large number of people. If you end up loving this past time you could choose to pursue it as a career. If you are a bookworm then this is certainly something productive that you could do in your free time. There are innumerable ways to get your hands on a good book, whether you take a walk to your nearest library, you borrow one from a dear friend or if you are a tech savvy person then you could simply download your book with the quick click of a button. A good book is something that can transport you from your immediate surroundings to another world all together! In your free time you could choose to do a variety of different things as improving useful skills to learn where your talents or interests lie. Rather than focusing on only one thing, if you tried your hand at many things you could easily get to know yourself better. Often people tend to confuse their interests with their abilities and trying new things could really surprise you, like something you never thought you could ever be good at might be something that comes very naturally to you. Scrapbooking is a past time that many people indulge in when they are free. Initially it might start off as a hobby but over time you might get addicted to it! It is certainly a very productive way to spend your time, you could choose to make a scrapbook about a place you recently visited or even on all the places in the world that you would like to visit and fill the pages out when you do. You could always head down to a stationary shop near your house and buy a few things. Spending your free time down is fun; however the most rewarding thing would be spending your free time with others who do not have anyone to talk to. There are innumerable senior citizens who are made to live in old age homes once they have reached a certain age and are incapable of taking care of themselves. These people long for company and it would really brighten up their day if you choose to spend some time with them and enjoy your time by making someone smile. Trying to survive in this modern world is tough indeed. It is of paramount importance to spend at least a part of your free time in meditation so as to ensure that you do not crack under pressure and undergo a mental break down. People that meditate are those that are able to survive better under pressure as opposed to those that do not know what to do when things get out of hand. The practice of Yoga has proved to be helpful to millions across the globe. In this day and age there are many people that have forgotten the importance of God in their lives. They think themselves to be invincible. In your free time activities to do include a point to spend some quiet moments in prayer and thank God for everything that he has blessed you with. Even if it is five sincere moments you have spent in prayer you can be rest assured that God is going to be by your side in your time of need ,when you have no one else to turn to. When you have some free time one productive thing for you to do is watch a movie that has received a number of good reviews. It is not necessary that you have to head to the hall you could always download it and watch it from the comfort of your own home. Watching movies is a way that most people choose to spend their free time however ensure that it is not a silly one, rather it is one that is enriching for you. A great way to productively spend your free time would be looking into your personal care. Whether it is your nails that need filing, your clothes that need ironing, your hair that needs to be oiled or your shoes that need to be polished you should look into it. Only when you look good can you feel good. If you have a haphazard and shabby look about you then people are unlikely to give you the respect that you deserve. In this busy life, getting a little free time is like a boon. When people get a little free time, most of them spend it as per their likes, where few make the most of it (productively). The general ideology of people desiring for a happy life is to stay healthy and have a proper balance in life. To make your life even more beautiful you need to gain a hobby or do things which are worthful. And the best time to do is the free time which you get. Doing so will boost up you to make your life a happy and enjoyable one. 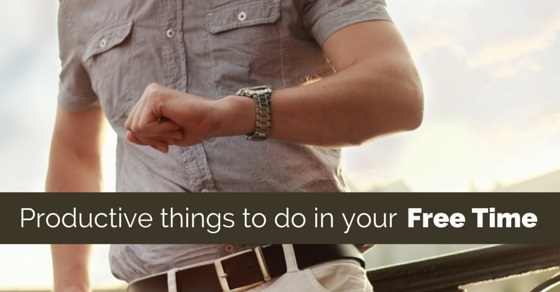 Here are a few productive things that you can do in your free time. The best way to use your free time is spending with your friends and family, but if you get a little time, say few minutes, then here we have bought you some interesting things which you can do and make your spare time productive enough. People become successful not only because of their unique features and great strategies at work but also by their ways and the methods of spending their time productively. Also, they do not extend their working hours(only if necessary) or work all the 7 days a week. Instead of burdening yourself with more work during your free or spare time, you should rather use this productive time to do tasks that are not going to add to your stress levels in any way. Though in this day and age having money is important so as to make two ends meet but making memories are equally important. No matter how much money you make at your workplace spending some happy times with your family and friends is surely worth more than a million bucks!